The groups are designed to hold the police to account regarding policies and practices within daily policing and IAG members will be asked to provide a community perspective on specific incidents. We have two groups on the Island, one for adults and one that’s been launched for people aged between 16 and 24 who feel they may have an interest in the emergency services, or who want to give something back to their local community. There are opportunities for members to: 'ride along' with officers to better understand operational policing, be involved in scrutinising stop and search activity and hate crime investigations, and our response to domestic abuse. It’s an opportunity to really make a difference and ensure the thoughts and concerns of the community we serve are represented. Please do not feel you need to have a background in working with blue light services to be a member, in fact it is better if you don’t. The group meets around four times a year, plus being called together to advise around key events. As part of the IAG for young people you won’t represent any particular community or group, so there’s no pressure, you’ll just represent yourself and give your own views. Everyone sees things from a different perspective and that helps to give a different, and independent, view that helps us to have a better grasp of the community’s ideas, thoughts and feelings. 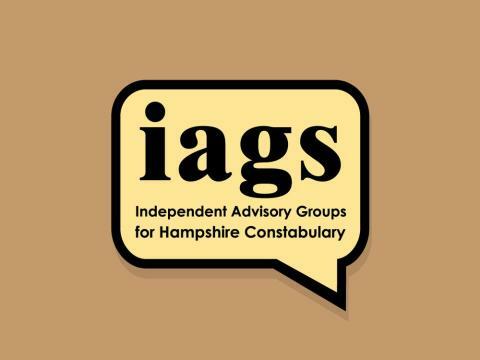 Chair of the Isle of Wight Independent Advisory Group (IAG), Alex Gryffe said: “As an IAG member, you will represent yourself and your own views or that of your community. The key thing is that applicants don’t have any connection to the police service in any way, but do want to represent the community here on the Island. “We gain an insight and have a different perspective on many high profile investigations. Our work helps the police to understand what residents on the Island want and need, especially if a crime causes concerns in specific sections of the community”. There are some forms to be filled in, as some standard vetting has to be undertaken, but help can be given with these. The meetings are usually held in the early evening and help with transport for young people may be available.